The EAS Control Kit gives user the ability to monitor EGTs and adds the power switch to control multiple accessories with an On/Off digital power switch. The EGT probe is a sensor that allows users to monitor critical Exhaust Gas Temperatures to ensure added power is not creating excessive heat which, in turn, can cause engine damage. This kit is ideal for the daily diesel driver or if you are towing then it's a must have! Towing can put a lot of strain on the truck and make it run hot. Don't be left on the side of the road with an overheated truck because you didn't watch your Exhaust Gas Temperatures with the Edge EAS EGT. 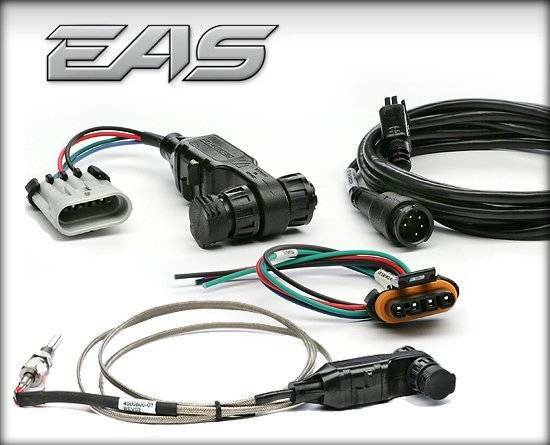 The EAS Power Switch is a tremendous new feature for truck owners! Customers can now hook up accessories like aftermarket lights, air compressors, etc. and engage them from the CTS/CTS2 device. Install the new switch and either use Edge's MyStyle software to name your accessory or with the CTS2 rename those accessories right from your device. The CTS2 comes with an all-new screen layout that can monitor up to 6 gauges and 4 rocker switches for the ultimate control. Take advantage of Edge's clean EAS daisy chain link system to turn your truck's tools on/off.